Climbing Longs Peak and Sky Pond was well planned activity by Avishek Roy who is known for his Nature photography among my office adventureres. It was planned one month back and communicated to the expected members. The final lot was Avishek Roy, Abhay Sawant, 1st timer Parikshit Sharma and myself. 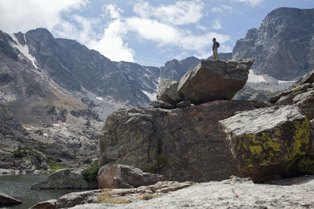 The initial plan was to climb Longs peak on Saturday and if everybody is fit then visit another peak in the vicinity else do the Sky pond hike. On Friday 23rd Aug we had planed to leave office early. To my surprise my wife showed up in the office along with my 20 month old daughter. This was 1st time ever after marraige I planned for such trip without family. After see-off we drove to Chicago Midway airport with Avishek car. The flight to Denver was delayed by 20 minutes. We reached Devor at around 5:50p and continued further journey with rented car towards Rocky Mountains National Park. On the way we had our dinner at Sherpa restaurant in Essts Park area. After Dinner continued the journey to Rocky Mountains National Park where the Base of Longs peak parking lot. We had planned to rest in the car since within few hours we were supposed to start the trek. On Saturday 24th Aug we started the Hike at 3:30am at the height of 9000ft. Everyone of us had our headlamp except me. It was well set trail route and everyone felt comfortable walking in the cold. We reached the peacock lake (11000ft) by sunrise, covering 4.5 miles. On the way rare seen family of bird called white tail Ptmagin, totaly camoflaged like color of granite rock. Our speed reduced a lot after this while passing through bouldar field untill next washroom facility below the key hole spot. The last patch of 100 ft scrambling on big rocks was easy part but by the time weather god tried his trick with heavy cold wiind blowing at the altitude of 13500ft. We saw the chain of hundreds of climbers already on the way to and fro longs peak but at this point of time most of the climbers decided to return back since the rain cloud might make the weight boulders difficult to climb down. We waited for 15 minutes and made a call with team decesion to return back from this point 3 of us already had headech due to altitude while one of our teammate was unusaually slow. We started the descend at 12 noon and took 4 hours to reach the base. We saw hungry marmot and mountain rats while lunch break. On the way we ( my self and Avishek) were bit worried when we heard the helicopter howering while we were near peacock lake thinking our slowest member might have been casualty. But nothing was so bad and we were fortunate to see the the helicopter went back after circling around the Longs peak. Also some of the fellow climbers told us the slowest member is moving very slow after enquiring about his where about. Later myself and Avishek decided to go down and wait until his arrival. By the time I told Parikshit to move down as early as possible since he had headech. We reached the parking lot by 4:15p. Decided to get some coffe and arrange the night stay nearby. Luckily we got one motel. After all formalities done we went back to Parking lot to receive our last teammate. He came by 6:30p. And we all were releived. Immediately we went to motel took some time to fresh-n-up and ready to move out for dinner. After dinner in the Thai Kitchen restaurant we went back to motel for closing the day. On Sunday 25th Aug. at 3am Avishek drove alone to the base of Longs peak since we wanted to catch some morning pics of Chasm lake which is above peacock lake at around 12000ft. The resting team woke up at around 7:30am. After refreshing coffee got close glimpse of elk, grazing and enjoying the morning sun. Avishek returned to Motel by 8:30am, by that time we were ready for our next venture and that is undoubtedly the Sky Pond since no-one had energy reserve to spend next such hike to another 13 thousanders peak. It was 9 mile total hike to Sky pond which is at 11500 ft. Before the hike Avishek drove us to highest road head in the park which was very scenic. Later we started the hike to Sky pond at 11:20a and passed through the series of scenic lakes on the way including Alberta Fall, Loch lake, lake of Glass. We returned back by 4:30p to the parking lot. spend some time to frehs-n-up and return jouney to Denver to catch 9:50pm flight. Unfortunately the flight got delayed by 30 minutes. After Arrival at Chicago again we were unfortunate to wait for 30minutes for the Share Taxi. Reached home back in the early morning of 3am. Overall the I liked the hike since it took most of the energy and also sense of altitude gain after long time. Also the freshness of the Sky pond and other ponds on the way recharged our batteries. I will recommned this hike to everyone who loves to sweat more sometime in short time by taking care of altitude seakness.